Paul Benedict, at table, plays Spalding Gray at The Yard. 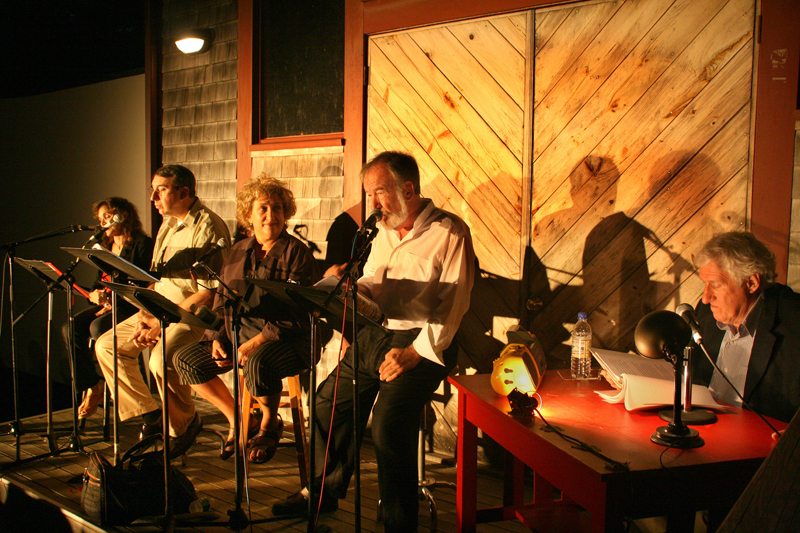 The actor and longtime Aquinnah seasonal resident Paul Benedict was found dead Monday in the Vineyard Haven apartment where he had planned to spend the winter. He was 70 years old. Known best for television roles ranging from the mad painter of numbers on Sesame Street, to Harry Bentley on The Jeffersons, Mr. Benedict was on stage at the Vineyard Playhouse in August performing in Rubles Two, short plays inspired by Chekhov. Mr. Benedict’s death was sudden and appeared to be from natural causes. An autopsy was to be performed yesterday in Boston to determine more details, Dr. Yukevich said. Theatre veteran Robert Brustein, founder of the American Repertory Theatre in Cambridge and honorary board member of the Vineyard Playhouse, said yesterday he knew Mr. Benedict through both. “He was just a lovely man and a lovely actor, and he was very devoted to the Vineyard,” Mr. Brustein said. Mr. Benedict did a lot of staged readings and plays on the Church street stage, Mr. Brustein said, including a reading of his collection of short works, Seven Elevens, with Tony Shaloub and Brooke Adams this past summer. “He was totally modest and very unassuming,” Mr. Brustein said. “Paul loved to be on the stage and would choose the stage over anything,” he added, though Mr. Benedict also appeared in film and television. “Paul did not demand anything in the way of billing or other ego things, he just loved to be on stage,” Mr. Brustein said. “He would have his family up [to Aquinnah] every year for two weeks, and that was when he would not act, because he would focus entirely on squiring his family around the Vineyard,” Mr. Brustein said. Mr. Benedict had an extraordinary face, with an elongated jaw and what Mr. Brustein called a Habsburg chin. The unusually long face was, Mr. Brustein said, “due to the fact that he suffered from pituitary disease which actually was identified by a doctor in the audience watching him” in Boston. Mr. Benedict used his face to great effect as the eccentric who painted numbers between 2 and 11 — on streets, Stockard Channing’s umbrellas, bald heads — in the PBS series Sesame Street. Aquinnah resident June Manning recalled the gentle Mr. Benedict coming to do his number-painting act for children at the Martha’s Vineyard Hospital and its day care center years ago. She said Mr. Benedict “took his citizenship on the Vineyard very seriously,” contributing whenever he was asked. Born in New Mexico, raised in Massachusetts and educated at Suffolk University, Mr. Benedict had a theatre career which began at the ART and spanned stages from New York to Los Angeles; he also directed regularly off-Broadway. His film roles included the director of the gay Richard III play in The Goodbye Girl, Smitty Brown in This is Spinal Tap and Not Guffman in Waiting for Guffman. His appearances on television ranged from episodes of Kojak in the 1970s to Seinfeld in more recent years, with his longest running role being Harry Bentley on The Jeffersons, through the mid-1980s. Plans for an Island memorial service in mid-January are still being formulated. As a friend of Paul Benedict's for forty-seven years I can tell you with certainty that his stage career did not begin with ART. It began with a troupe called The Image Theatre at a coffeehouse called The Place on Huntington Ave.in Boston which was managed by Paul in 1961. He played his first roles there. After some summer stock in Keene , New Hampshire in 1962 He then moved with the Image company to their new theatre on Charles Street. He was spotted by David Wheeler and invited to work with The Theatre Company of Boston in 1963, an association that lasted for many years and many plays. David wheeler later introduced him to ART 30 years later. Here it is four yrs. later but (owing to the wonders of the internet) I just came across news of Paul's passing. He was one of my teachers at Boston University's Theatre Arts school where I majored in acting (Class of '68), so it would have been in the late 60's. Perhaps he was a guest lecturer for David Wheeler who was on the faculty as that point or perhaps we had him for a whole semester. The theatre dept. was a highly competitive environment, charged with outsized egos. Paul Benedict was not among this cohort. What I remember so well about him, after all these years, is his kindness, his humanity, his lack of ego. We were supposed to practically worship him for his extensive acting and directing credits. Certainly he was respected for that and a sharp mind, but he earned my special admiration for the way he deflected any kind of celebrity status and met us on our own ground, as students. I didn't know Paul personally. While I am saddened to learn of his passing, I am gratified to know that he was well appreciated and loved in the place that became his home. He struck me as a gentle, kind soul, and a deeply devoted actor-director and teacher. I am surprised to learn he was only 4 yr. older than I. He had accomplished so much, so early. To those who knew him well and loved him, I offer my condolences, late though they be.